San Francisco’s Outside Lands music festival returns for its tenth year to Golden Gate Park from August 11-13. The lineup has some pretty gigantic names this year, like The Who, Metallica, Gorillaz and Queens of the Stone Age, and the excitement doesn’t stop there. 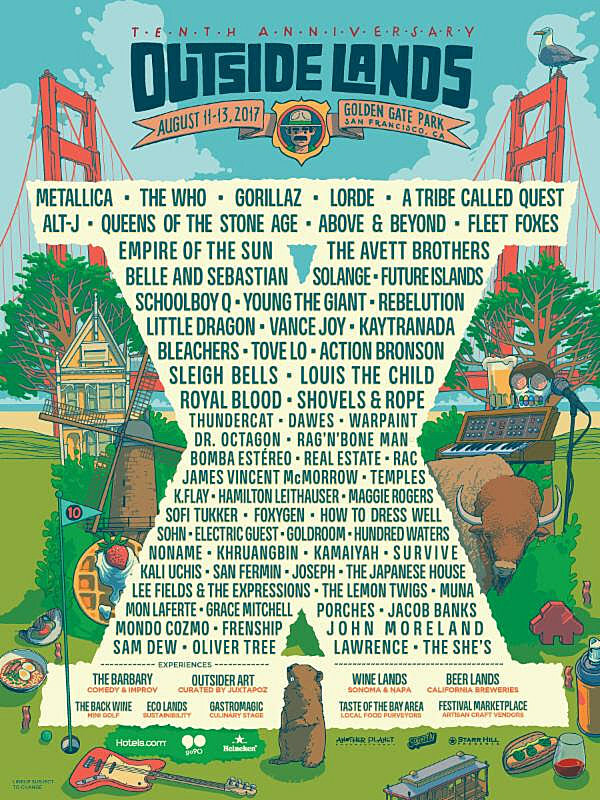 Also playing Outside Lands is Fleet Foxes, A Tribe Called Quest, Alt-J, Belle & Sebastian, Solange, Future Islands, Schoolboy Q, Little Dragon, Kaytranada, Action Bronson, Thundercat, Warpaint, Dr. Octagon, Real Estate, Temples, Hamilton Leithauser, Foxygen, How to Dress Well, Hundred Waters, Noname, Kamaiyah, S U R V I V E, Lee Fields, The Lemon Twigs, and more. Full lineup and an announcement video below. Tickets go on sale Thursday (4/6) at 10 AM PST. The Who and Metallica both also have headlining tours announced. Gorillaz recently announced their first album in six years and they have more tour dates TBA. Earlier today, Fleet Foxes revealed more new music off their first album in six years, and added dates to their world tour. QOTSA, who haven’t played live in a couple years, have been slowly announcing festival appearances for 2017 (this is their first in the US). A Tribe Called Quest and Solange — two of the more exciting names on the festival circuit this summer — are on a few other fests together, including FYF, Pitchfork, and NYC’s Panorama.